Steam version is not patched. The soundtrack is available for free at composer's website. To skip menu intros, replace menu and menus_01menu (in the same folder) with another shorter clip such as Pause.bik. This step is optional. The patch required for multiplayer is not included in the Steam version. Only Patch 1.02a is required. Patches can be found here. Not available in the Steam version. Install patch 1.02a to fix. Frame rate is capped at 100 FPS. See Run the game at screen refresh rate. 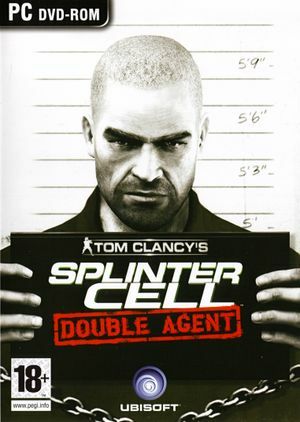 Open SplinterCell4.ini (single player) or Default.ini (multiplayer). There you'll find 2 lines: FullscreenViewportX = and FullscreenViewportY =. Replace with your desired resolution. Change the FOV. See Field of view (FOV). This solution is single player only. No known method exists for multiplayer. Half of the command buttons aren't bindable. 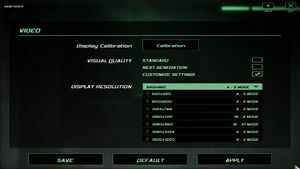 Manually edit SplinterCell4User.ini to workaround this. Only official wired Xbox 360 controllers. Shares the same slider with mouse. Prompts are text based (e.g. "Press Action key"). Using Direct Mouse Input will invert Mouse Y axis. 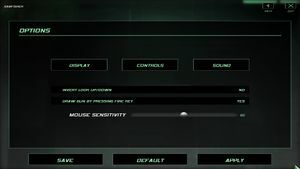 Open SplinterCell4User and set bInvertMouseUp=True to solve this while in-game. Menu will still be inverted though. Official localization by «Руссобит-М\GFI». Retail only. Patch for digital release here. 6 Online services are online but only accessible after manually installing Patch 1.02a. It is recommended to use existing Steam Groups to find other players (does not require game purchase through Steam). Game may often crash/freeze on saving and loading screens, as well as upon being maximized from the taskbar. Usually, it is followed by a C++ runtime error. A door in Emile's office leading to his bedroom cannot be opened, as the "open door" action prompt disappears too quickly. Stay close to him. If the door closes, it cannot be opened again. The game may freeze during the final mission after defusing the bomb and before the SWAT team enters. In the [Engine.Input] section bind to the buttons for the walk and ghost cheat. As soon as the game hangs, go into ghost mode. Fly in front of the bomb and switch off ghost mode (the walk button). This bug occurs while the game is set not to remove certain environment objects when Environment Detail option is set to "High". Mistakenly, the door appears to be one of those objects. Kinshasa (Part 2) map becomes excessively bright when user sets SimpleShader option to False in game's configuration file to improve visual quality. Find all the lines reading bEnhanceNightVision=true and change true to false. 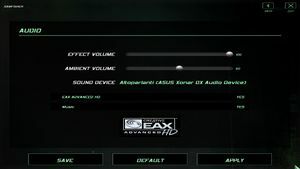 Game may default monitor refresh rate to 60 Hz, resulting in reduced smoothness and possible screen-tearing even if internal GPU render is at 100 FPS. 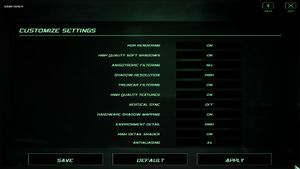 Open <path-to-game>\SCDA-Offline\System\d3d9.ini or %USERPROFILE%\Documents\My Mods\SpecialK\Profiles\SplinterCell4.exe\SpecialK.ini depending on the installation method you used. HidePieces=True ; => Setting it to "False" will add a few objects to the environment, but it will cause the coast guard to get stuck in the door on Cozumel and introduce a couple of graphical artifacts throughout the game. While "True" is recommended for the sake of compatibility, you might consider setting it to "False" to have more Environment Details in game. bEnableHDR=False ; => Disables HDR rendering. Bloom effect is still active, while HDR tone mapping will be disabled. UseVSync=False ; => Does not touch Vsync. It's actually dis/enabled elsewhere. Translucency=True ; => For semi-transparent ice, which is broken in the game. Setting this to false does nothing wrong. The transparency in the game still works. UseHWShadowMapping=False ; => Designed for older GPUs. Not needed now. ShadowResolutionDegree=0 ; => 0 is actually the High resolution shadows option in-game. ShadowTurnOffDegree=100 ; => A higher number is better. It tells the game at which distance to render lights with shadows. 200 is maximum, which renders all lights at any distance. bUseSmoothShadow=False ; => True does NOT work properly. It will actually mess up your shadows. FSAADegree=0 ; => Setting Anti-Aliasing to 2 or 4 will disable HDR rendering and very likely cause a "Frozen Frame" issue during cutscenes. Not recommended. AnisotropyDegree=1 ; => AF does not work. If you want AF in the game, force it through the video driver. ↑ 2.0 2.1 File/folder structure within this directory reflects the path(s) listed for Windows and/or Steam game data (use Wine regedit to access Windows registry paths). Games with Steam Cloud support may store data in ~/.steam/steam/userdata/<user-id>/13580/ in addition to or instead of this directory. The app ID (13580) may differ in some cases. Treat backslashes as forward slashes. See the glossary page for details.